My first Spotlight Saturday's guest is C.A. Szarek. I've been blessed to know her for a couple of years and to have read her books. They are fabulous! Here's her first novel that was released earlier this year. 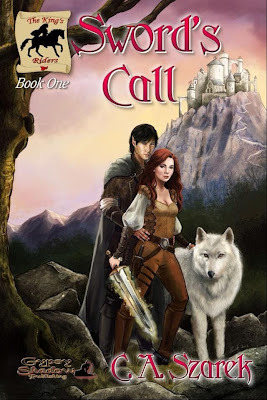 Sword's Call (King's Riders Book 1) from Gypsy Shadow Publishing. AVAILABLE NOW! Ebook and Print! 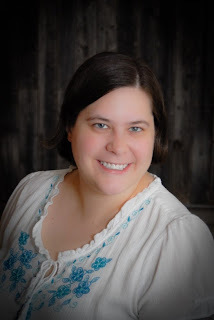 Author of fantasy, paranormal, romantic suspense and the occasional YA. 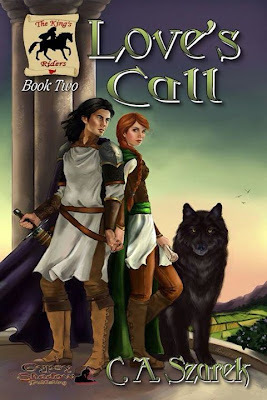 Sword’s Call (King’s Riders Book One) AVAILABLE NOW from Gypsy Shadow Publishing! Collision Force (Crossing Forces Book One) AVAILABLE NOW from Total-E-Bound Publishing! Love's Call (King's Riders Book 2) will be released late 2013 or early 2014 from Gypsy Shadow Publishing. Ebook and Print! Senior King’s Rider Ansley Fraser has been in love with Leargan Tegran for turns, but he’s never noticed her. When she sets out for Greenwald to deliver a message to the duke, she has no idea its contents contain an order that will change her life. Instead, she is focused on visiting dear friends. Leargan, captain of the Greenwald personal guard, is an honorable knight, so when the king commands him to wed Ansley, he intends to follow orders, even as he knows nothing of the girl. Ansley ignores her instinct to question Leargan’s sudden interest in her. She wants to fall into his arms—and his bed—even as Ali, her wolf bondmate, growls her reticence. Her extended visit allows Leargan time to win her affection, but when he falls for Ansley, it takes him by surprise. Will she be willing to give herself to him if she learns their marriage has been commanded by the king? What will it take to convince her he’s not simply following orders? Thank you for having me today, bestie! You're awesome! So excited!!! I can't wait for book 2! !